In our Working Girl Diaries series, accomplished women with fascinating careers give us a peek into three days of their lives. Dana Asher Levine is a stylist for some of the most powerful women executives in media, including the one and only Shonda Rhimes. 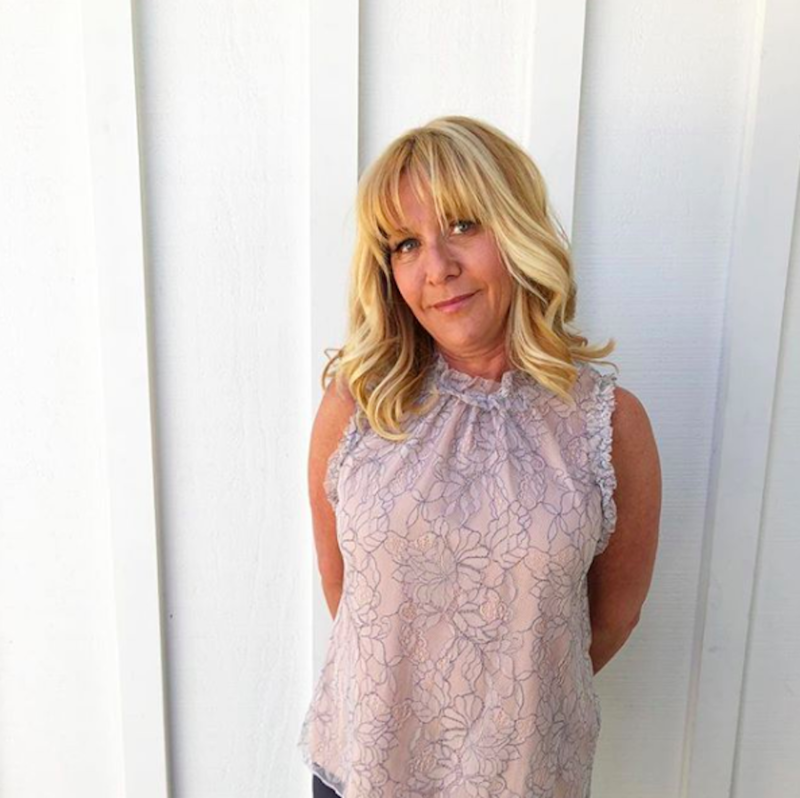 She calls herself a “power stylist,” or “The Clothing Therapist.” Her goal is to help dress women in clothes that represent the successful and empowered beings they already are. Levine aims to inspire all women to find their “uniform,” or the one outfit—at any price—that makes them feel unstoppable. Levine is passionate about styling bodies of all sizes and women of all ages, and her non-traditional journey in fashion informs her outlook. Dana was a 40-year-old single mother handling a divorce and struggling to provide for her three children when she set her sights on an industry she had no experience in. She had always loved shopping and believed in the transformative power of a confidence-boosting outfit, and with that determination, she created her own lane in the styling world. Once a new stylist with no credit and a major lack of funds, Dana now styles women like Fox CEO Dana Walden and manages $250,000 a month in her work as a stylist, personal shopper, and CEO of Dhstyle Inc.
7:00 a.m.: I wake up to my daily text from my oldest son, Matthew: “good morning mom, I love you!” Even though my children are now all adults, I talk to them daily. Being a mom is—and has always been—my most important role. 7:30 a.m.: My husband, David, and I spend 30 minutes on a short Peloton exercise class at home. We both have demanding jobs and it can be tough to see each other during the week, so we try to sneak in time as often as possible! Afterwards, I get dressed in my “uniform.” I guide all of my clients to find their own personal uniforms of their own—an outfit formula that, no matter what, will always make you feel comfortable and confident as you go about your day at work and home. My daily uniform consists of a great fitting jean (I am petite and prefer either Mother brand or L’Agence, and I ALWAYS get the length tailored, which I recommend all women do regardless of brand), loafers or slides in a bright solid or print (my go-tos are Gucci, but similar styles can be found at ZARA at a lower price point), a fun T-shirt or colorful light sweater, and a leather jacket topper. 8:30 a.m.: I get my hair blow-dried every other day. I would consider myself a hair-aholic. Before I started my later-in-life career as a stylist, I went through a difficult divorce and lost almost everything. While I scrimped and saved, only spending money on my three children, the one thing I would not sacrifice for myself was having great hair! 9:30 a.m.: I am in my home office, responding to client emails and texts. I start my work day with an Ice Blended from Coffee Bean via one of my lovely interns as we run down tasks for the day. We are prepping for a photoshoot with the daughter of one of my clients, who is building her lookbook as a model. 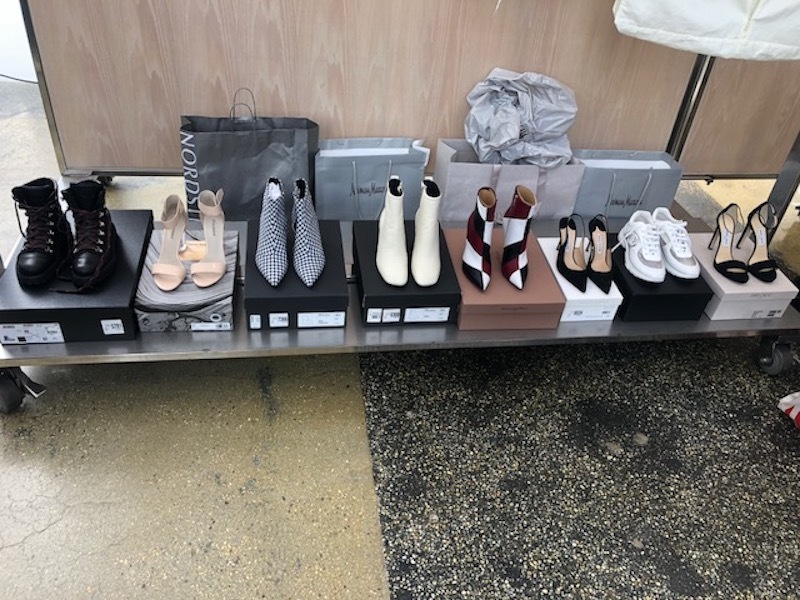 With the help of my interns, I cross-check the two racks of looks pulled earlier in the week, from formal to casual, including all shoes and accessories. 11:00 a.m.: We arrive at the photoshoot and set up all the individual looks. Next, the photographer goes through each outfit, approving or nixing any pieces. Before I pulled the clothes earlier in the week, the photographer sent me his vision for the shoot and I shopped accordingly. While the photographer is selecting looks, my client is in hair and makeup. 12:00 p.m.: We break for lunch on set. 1:00 p.m.: During the shoot, I watch the monitor closely and make sure that all articles of clothing are photographing well. All the fabrics look smooth, nothing is buckling, everything is laying properly, etc. If something looks off, I flag the photographer and jump in to fix it for the next frame. 5:00 p.m.: The shoot wraps, and I head home to my husband. 6:30 p.m.: My husband and I have a standing martini date night every Friday. We are coming up on our fifth anniversary, but we’ve known each other since we were young and reconnected later in life. I try to be home to cook dinner for my family Monday-Thursday, but I’ll often have to be back at work post-dinner. Sometimes my workdays don’t end until 11 p.m., as most of my clients work long hours, so I work with them on late nights and weekends. 8:00 a.m.: It’s the weekend, which is the busiest time of the week for me. I spend the morning in my home office/closet organizing potential looks—or a pull—for my client Dana Goldberg. Dana is a producer, and she is headed to France for the premiere of the new Mission: Impossible film. I will be pulling her wardrobe for the entire trip. 11:00 a.m.: I stop by Neiman’s to pick up several items that I need to complete Dana’s pull. As I drive up, I chat briefly with the valet, whom I have known for 20+ years. Whenever I meet anyone, from a photographer’s assistant to a head of a studio, I always try to remember at least one personal fact about them. I learned very early on in my career that every relationship is so important to cultivate, and none is more important than the other, regardless of perceived career “status.” I meet my “work husband,” Ross, inside Neiman’s. He is my primary sales contact at the store; I’ve also worked with him for over 20 years. 2:00 p.m.: I pick up additional pieces at Saks and Nordstrom. Today, I spend $43,000 between several clients, which is about an average daily spend for me. The most money I ever spent in one day was $1,150,000. My clients typically keep about 80% of what I pull for them, and the rest go back. At this point in my career, I am able to pull everything on consignment and then return what my clients choose to decline. In the beginning of my career, before I had formed any close relationships, I wasn’t able to pull on consignment. Industry standard would have required that I put everything on my personal credit card initially, but when I was first starting out, I was going through a toxic divorce that left me with no credit, no money, and no collateral. So I would leverage my burgeoning relationships as much as I possibly could in those early days to get the business going, asking for favors left and right—faking it until I made it! 3:00 p.m.: Before heading home, I stop for my customary blowout at my salon. 4:00 p.m.: I head back to my home office/closet to rack and bag the pull. 4:30 p.m.: During my organizational process, I capture content for my Instagram account, @TheClothingTherapist. 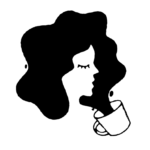 Through my feed, I am aiming to build a platform to help women feel good about themselves and dress for success at any price point. 7:00 p.m.: I break for dinner and go to one of my favorite restaurants, Craig’s, with my husband and some of our couple friends. 9:00 p.m.: After dinner, I return home and go back to work. I continue to sort and bag for each upcoming event, focusing on the fitting with Dana tomorrow. I label each bag per client, per clothing item. I am hyper-organized and know where everything is at all times to make the best use of my clients’ time at fittings. 8:00 a.m.: David brings me my Ice Blended from Coffee Bean, and my daughter and my summer intern assist me in loading up the car. They will come with me to the fitting as well. We will be trying on over 70 pieces, so having the extra hands helps to streamline the process and keep everything moving on time. 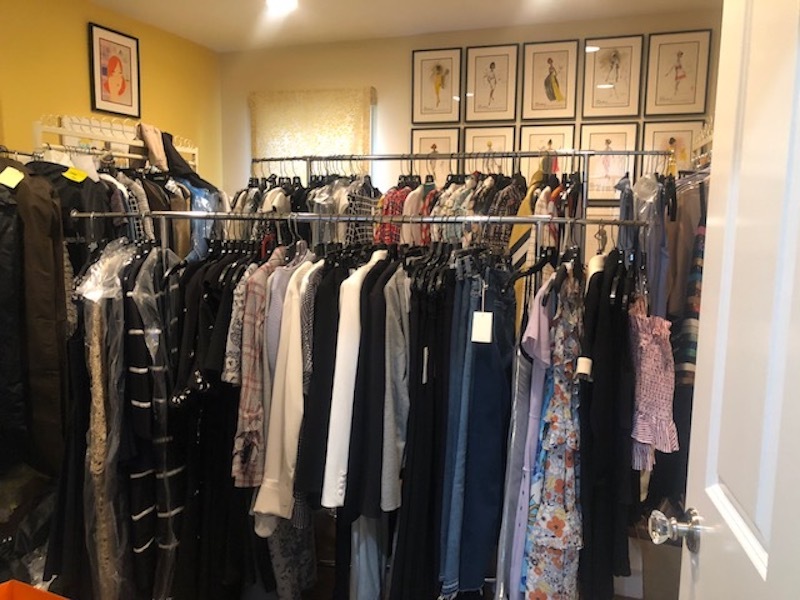 9:00 a.m.: I arrive at Dana Goldberg’s home with four full racks of clothing, approximately 70 pieces in total, which includes red carpet looks, travel clothes, and business-appropriate looks for both her and her wife, down to the shoes and accessories. My job can entail anything from pulling a gown for the Emmys to sourcing all-white looks for a client’s vacation to Wimbledon. I often travel with my clients during lengthy press tours, pulling and doing fittings before the trip and dressing the client in advance of each appearance on the road. Dana is a film and TV producer whose projects include the Terminator franchise, the Mission: Impossible franchise, and the Jack Ryan series on Amazon. As a general rule, I never watch any of my clients’ projects. Coming into someone’s home and getting them dressed is an immensely personal job, and I don’t want a client to ever feel that I am there as a fan. In fact, I’m often described as a “clothing therapist” for my clients. I style Michelle King (producer for The Good Wife), who once gave me box sets of the show. I’ve heard amazing things, but I still haven’t watched! 11:00 a.m.: We wrap up with Dana and her wife. We schedule a second fitting for next week to finalize looks, to bring in any new sizes, etc. 11:30 a.m.: I arrive at my second fitting of the day, this time to style a mother of the bride. We had spent more time than average searching for the perfect dress for her daughter’s wedding, and today we finally found one that she loves. Success! 12:30 p.m.: I drive home and quickly unload the the clothes I’ll be returning. On Monday, my regular assistant and I will handle the returns and pay for what the clients are keeping. 4:00 p.m.: I head to both Gelson’s and Vallarta market and pick up ingredients for dinner. On Sundays, I love to cook for my 23-year-old son and his roommate, my daughter, and David, so we make a big family dinner at home. Tonight, it’s traditional carne asada. Cooking for my family and eating together is always the highlight of my week. 6:00 p.m.: Dinner is served! 9:00 p.m.: After dinner, my husband goes to bed early and I stay up watching my previously recorded shows. I love guilty pleasures like Below Deck, and I just started Dietland. I also read before bed—my favorite book I’ve read this year was Dumplin by Julie Murphy. 10:00 p.m.: Time for bed, ready for another busy week ahead! First thing tomorrow, I have a meeting with Saks regarding a client who will be going to Paris Fashion Week. No two days are the same, and that is why I love my job.